Found one file extension association related to DDChange and 1 file format developed specifically for use with DDChange. With Dinkey 2 and Dinkey Net you have the facility to change any of the protection parameters at any time and as many times as you like, just by issuing your customer with a short code. This code can be used only once and is unique to the customer that you send it to. As you can imagine this is an extremely powerful tool. Here are some of the possible strategies available to you with Dinkey 2 and Dinkey Net. You can send out your full system as an evaluation package that will either run a certain number of times or will stop after a certain date. Should the customer decide to purchase your software, you can convert the evaluation package to operate without restriction just by issuing a password over the telephone. Dealers could hold evaluation copies of your software to demonstrate to customers without risk to you. A variation on this technique allows you to ensure payment for the goods. You could send all your software out with a limited execution date so that it stops working should the customer not pay for the goods within a certain time. A similar scheme means you can supply your software to dealers on a sale-or-return basis without danger. Software developers often sell different versions of their products with different modules/options. For example, you may sell a cut-down version at a low price to whet users' appetite for the full system. With these dongles, you can include all the options in the first place but only activate those you want them to be able to use. If you wish to add or remove options at a later date, you can do so over the telephone. 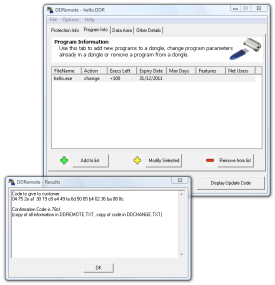 The DDChange software seems to be old or discontinued. If you need more information please contact the developers of DDChange (Microcosm Ltd.), or check out their product website.